The Harp Celebrates 20 Years with 1993 Prices and more! 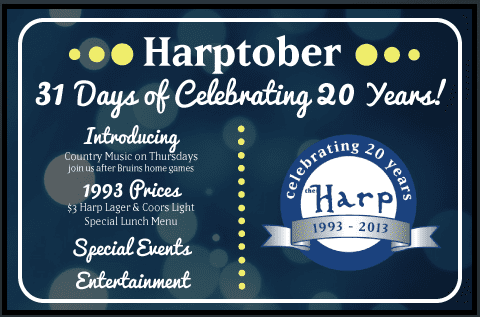 The Harp is celebrating 20 years in Boston with special events, entertainment and prices from 1993 during lunch (11-3pm) and during all Harptober events! The menu ranges from clam chowder at $3.95 to fish and chips for $6.95 and $3 for Harp Lager and Coors Light! For more information or to check out Harptober’s 1993 menu prices, head here.